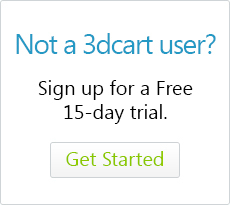 Can I change my user name from 3dcartadmin/storeadmin? Many merchants have asked if they can change their default username for the 3dcart Online Store Manager to a user name of their own choosing. Unfortunately, the default username cannot be changed since it is automatically created by the store software when your account is provisioned. However, you can create a new user access for yourself using whatever username that you'd like. Please click here to learn how to set up a user account in your store.